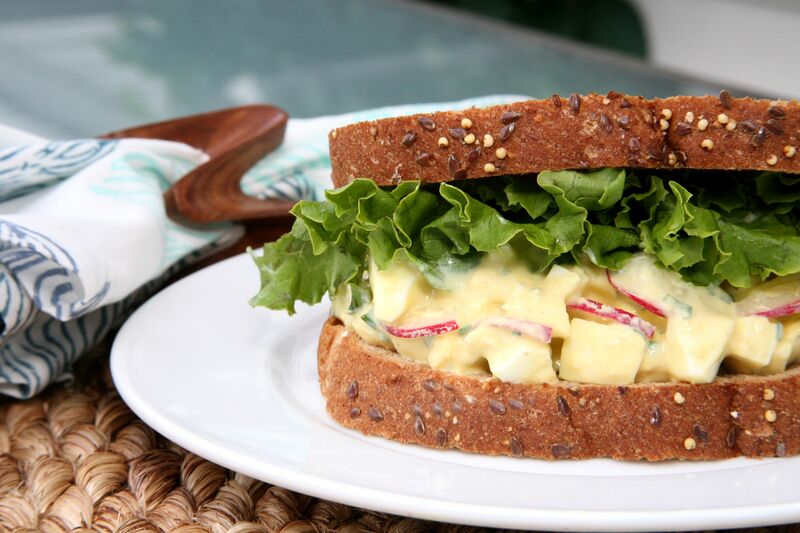 I like the addition of radishes to this egg salad, because too often I end up throwing out radishes that grow in age simply for not having more ideas on how to use them past the generic salad topping or vegetable platter. Radishes provide some rad (too much? :)) health benefits as well! You may not know they have a high water content, lots of vitamin C and a respectable amount of phosphorus and zinc! Radishes are a nourishing low calorie food and this is the perfect time of year to add them to your meals! Anyone one else have recipes using radishes to share? Let us know in the comments section! Boil 8 eggs, transfer to a bowl of ice water and allow to cool completely. You can also use eggs from the fridge that were boiled earlier in the day or previously. Peel and rinse your eggs. Chop roughly and add to a large mixing bowl. Rinse your radishes, thinly slice each one and add them to the bowl of chopped eggs. Rinse your chives, cut them using herb scissors and add them to the mixing bowl. Measure your yogurt/miracle whip, mustard and salt and add to the bowl. Toss all ingredients in the mixing bowl until they are well combined. Scoop a serving onto a slice of whole grain bread, top with sprouts or lettuce and finish with your second piece of bread. Enjoy! As always, thanks for reading! !